Among the instruments purchased for Enlightenment and currently displayed at Derby Museum is this miners dial or level. Miners dials or levels are not uncommon in Derbyshire because, until about 30 years ago it was a mining county. Now, however, all the coal mines which once thronged the eastern side of the county from Renishaw to Stanley and the south of it from Swadlincote to the Leicestershire border by Moira are all closed, following the lead mines before them. The Miners’ Dial is a compass-like instrument, the forerunner of the theodolite, used for measuring angles of underground passages or mineral ore seams. They had open fold-up/fold-down sights, a 360 degree face with a magnetic needle and a Vernier scale enabling angles to be read to the nearest 3 minutes. 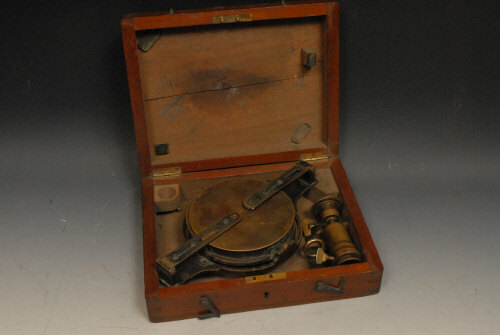 Davis Derby (John Davis) was a family business established in Leeds in 1779 by Gabriel Davis as a manufacturer of optical, surveying and mathematical instruments. Gabriel Davis’s nephew John was born in the village of Thame in Oxfordshire in 1810, he becameapprenticed to J Abrahams who styled himself as Mathematical Instrument Maker to the Duke of Wellington. On completion of hisapprenticeship in his late teens, John Davis moved to Leeds to join his uncle’s family business. In the early 1830`s John Davis travelled regularly betweenLiverpool Cheltenham and Derby to sell his products. John continued to visit Derby for the next decade. In 1843, perhaps attracted by the railways and the rapid transition taking place in Derby, he took upresidence with his family. John bought the free-hold of the sixteenth century Meynell town house, which is now the oldest surviving premises in Iron Gate, Derby and at the rear of thepremises built a workshop to produce his products. The house was to be thefamilyresidence for around 20 years. At this time coal production in the UnitedKingdom had risen to 55 million tonnes and 250,000 men, women and children were employed underground. Around 1840 John Davis began to manufacture mining equipment such as mine safety lamps based on the designs invented by Sir Humphrey Davy in 1815. Production of miner’s lamps continued for more than 100 years, reaching 10,000 a year by the end of thecentury. John Davis quickly became famous in mining circles as apioneer in the use of electricity in mines and for his mining products. The company continued to manufacture the Hedley dial until around 1960. John Davis died in 1873 at the age of 63, and his son Henry Davis was appointed to run the business. Under the leadership of Henry Davis the business continued to expand moving to new premises in November1875 at All Saints Works, Amen Alley in Derby, close to the Cathedral. The earliest surviving Davis Derbycatalogue is dated in 1877 and shows that products included turret clocks, weather vanes, surveying instruments, a wide range of miner’s lamps and electric bells for both mining and domestic use. The West and East (and North and South) are reversed as the dial was designed to be used with a mirror. No, not true. Its because the card remains stationary whilst the two sights move round it. If a mirror was involved print would be back to front. Ohhhh, thanks for the information. I will share it with my colleagues!